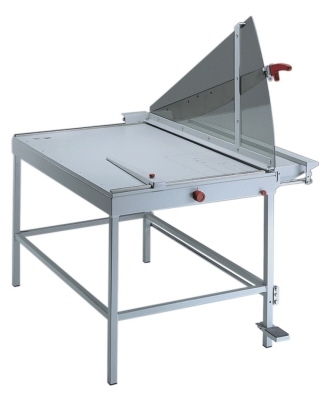 Triumph Large Format Guillotine Paper Trimmers - Table Floor Models provide precise control over your work area and cutting task. Each unit comes with it's own stand and has a built in safety guard for added protection while cutting heavy duty large format materials. The guide rules are easily adjustable to fit your paper and printed matter sizing needs, while a built in clamp secures the material for a final trim. The work base also includes measure and sizing tools right on the face of the work surface. Backed with Ideal-MBM's solingen steel blades, these models will keep performing year after year. Kutrimmer table / stand large format available models are: 1080 and the 1110. 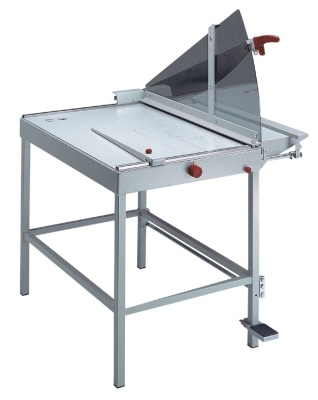 The Kutrimmer 1080 Paper Cutter is a table type floor stand model with a wide area format cutting capacity. Designed for commercial applications where precision and accuracy is a must. Triumph and Kutrimmer has been known in the print trade industry as a leader in precision cutting equipment all over the world. The design and engineering of their equipment can be used in offices and for other commercial applications including schools, mail rooms, art departments, graphics design and print shops. Large format is what the Triumph 1110 (Kutrimmer) Guillotine Cutter - Ideal-MBM paper cutter was designed for. With one of the widest working sizes available in a guillotine trimmer - this model can handle it all! Built using exacting standards, the work area on the base of this unit is imprinted with cut guides and measures so you can accurately cut with-out having to use a ruler or tape measure. The adjustable back-stop can quickly be set and locked in place using the rotary clamp, and the extending table provides support for trimming large jobs.